To find out more and to join his mailing list, visit http://www.mattbeighton.co.uk. Alternatively, don't forget to +Follow this author page to stay up to date with all his latest work. The Spyglass and the Cherry Tree by Matt Beighton is the first book in The Shadowlands Chronicles. Skye doesn't believe in her mother's goblin ramblings. Now she's in for a dreadfully dull holiday with her grandparents and away from her best friend, Arthur. Her holiday takes a turn when she discovers an old spyglass and suddenly gets swept into a world full of goblins and other beings she thought were only in stories. She's thrown into the middle of new dangers and rescued by goblins who claim she's part of a prophecy meant to save them. Before she can confront the Dark Queen, she sets out on a journey to find the magical stone, Akeldama, where she'll have to find her bravery and face her fears. Skye embarks on an adventure beyond her belief, turning a summer with grandparents from dull into a dangerous adventure in a unique take on journeying into another world. She'd often belittled her mother's rantings about goblins and other assorted creatures so it's an interesting change for her to see these creatures up close. Matt Beighton opens up a magical world full of danger and darkness with deadly creatures and an evil queen. Skye's part of this epic prophecy that says she's meant to save all the magical beings from a dark queen so she's placed in a position of power and strength where she is finally feeling strong and not helpless. Skye has a hero's quest where she has to steal the Akeldama in order to stand a chance against the queen, but this is only a fraction of her journey. Beighton weaves a subtle psychological component into the plot as Skye has an emotional journey to confront her fears and to find her strength as the hero this world needs her to be. The Dark Queen has psychologically based abilities and uses these powers to manipulate Skye emotionally by preying on her fears and insecurities. Skye has to confront these feelings and accept them to become a hero. She demonstrates strength and bravery that carry her through every dangerous situation and against these magical creatures who want to harm her. Beighton uses a variety of creative names matched to the characters, such as Brabble, Brack, Snowbroth, Weard, and Snudge. 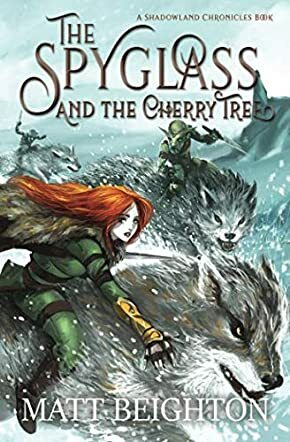 The Spy Glass and the Cherry Tree is a brilliant fantasy adventure with a journey about confronting fears and trials to become a hero, with a variety of eccentric characters, an evil queen, and the quest for a magical stone.